Shuttles from and to Port Elizabeth airport can be organised on request. Arrive in St Francis Bay, book into Sandals Guest House, and play a round of golf at the St Francis Golf Course. Dinner is served at Christy’s Catch, a seafood restaurant within walking distance from Sandals. After breakfast, drive to the St Francis Links where you will leave your car for the duration of the hike. 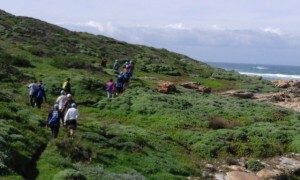 We will transport you to the Oyster Kayas in Oyster Bay where you will receive a lunch pack and set off on an out-and-back hike to Thysbaai. Return to the Lodge in time for dinner. We leave the Lodge at around 8h30 to tackle the Sand River, a 16km dune sea, which will take us up to 6hours. The hike finishes at the Dune Ridge Country House, where you can relax around the pool before you sit down for a scrumptious dinner. The 15km coastal hike starts at Dune Ridge and finishes at the Cape St Francis Resort, your host for the evening. The hike includes many highlights – the second largest blowhole in Southern Africa, an unmarked grave, shipwrecks, middens, and a visit to the SANCCOB penguin rehabilitation centre. 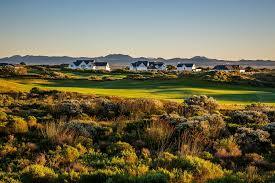 You will be transported to the St Francis Links for 18 holes of golf, followed by a farewell lunch in the Clubhouse. Non-hikers can enjoy the full tour, however, instead of hiking, drive themselves to Eersteriver (Fynbosch Golf Course), Hankey or Humansdorp (Zwartenbosch Golf Course) for more rounds of golf while we hike. You will reunite with your group in time for dinner. These rounds of golf are not included in the price. Accommodation is in top class guest houses and a resort. The price for 6 days and 5 nights is R8 600 per person sharing, and includes all meals, accommodation, two games of golf plus a golf cart at the St Francis Links, the canal cruise and calamari tasting. You only pay for your drinks, and additional games of golf.